This past weekend I was in Aspen for the 41st annual Ruggerfest. I’ve been attending this rugby tournament for the past 24 years and recommend it to anyone who has even the smallest interest in Rugby. Rugby is one of the most aggressive niche sports in the world and as with any niche, it has a strong culture. Over the last 24 years I have come to recognize the culture that shapes the game, its players and its fans. This weekend, while watching the games, I began to think about rugby and culture and realized that marketers going after any niche, need to partner (not simply take advise from) members of that niche. Similar to opening a business in a foreign land; you need a cultural liaison. Someone who understands the nuances. You’re not going to “get it” by knowing the language and simply scanning forums/blogs. Niches have their own language and with any language there’s a history to that language and a future for that language. 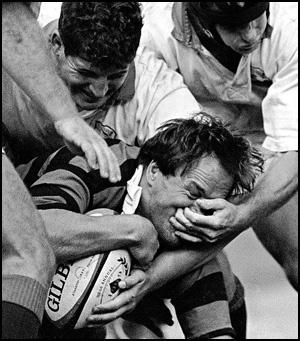 Rugby fans are familiar with terms such as ruck, scrum and knock-on. Marketers also need to be aware of generational and cultural differences (in the traditional sense) within the niche. The needs of the older generation of rugby players are very different from the younger players. (From the smell on the sidelines this past weekend it appears to be beer and BENGAY.) These generational liaisons also mean more partnerships with members of the niche and their may be the opportunity to create a micro-niche; the team that has partnered with me. It will be up to the partner to decide how much of an ambassador they will be want to be on behalf of the product/service. As usual, they control how deep the relationship gets. The Gentlemen of Aspen – 18, The Denver Barbarians – 9.